organic sofa | Laura's "Rules"
I know from some questions I’ve gotten that folks were worried about my sofa sitch. So for all (two of you) who were wondering: are Laura and Maya sitting on the floor amidst all those toxic dust bunnies? Or am I stuck in mid-air, in a yoga chair pose, hyperventilating as my thighs complain louder than an oddly persistent toddler at (twenty minutes past her) bedtime? Your fears can now be put to rest. We will soon have someplace actually and truly non-toxic on which to rest our weary dogs at close of day. In fact, I’m happy to report that I found a few affordable options for furniture free of chemical flame retardants! And you’re the lucky reader who gets to hear all about my quest. There may be other folks out there who do this in the big wide world as well. As it turns out, a possible trick is to find a custom furniture manufacturer who will work with you (or already has purged the chemicals), and then to decide the foam or filler that’s right for you. The trickiest part of the trick is that, if you don’t happen to be, say, Leonardo DiCaprio, you may also have to convince that individual to give you a decent price. Or the next time you need a new piece of furniture, you could just contact one or both of the companies below who make greener custom items. Any attentive readers of the earlier parts of the sofa saga may be cheered to learn that my initial assessment of one Mr. Kenneth Fonville as a truly good guy was not at all off-the-mark. Mr. Fonville, owner of Eco-Select Furniture, was kind enough to scan and send me his furniture foam’s Certipur label, knowing fully that I would run it by flame retardant toxicity expert and environmental scientist (and fellow North Carolina resident) Heather Stapleton. Stapleton, as anticipated, promptly analyzed its fake-ish assurances of eco-safety with aplomb, revealing that the label, in truth, said nothing at all reassuring on the topic of flame retardants. I cheekily shared her analysis with Mr. Fonville, who checked into the issue further with his foam supplier. He reported back that he was able upon request to purchase foam without flame retardants in it, and that his fabrics were similarly untreated. The offerings from Eco-select Furniture are largely traditional designs, covered in leather, hemp or other materials, with many green features, such as locally harvested sustainable hardwoods in the frames. They do use some soy-based foam in the furniture, rather than latex, for durability reasons. (Note that his blend is 25-30% “soy-based” feedstock and the rest is petroleum-based, which may be significant information for those wanting an ultra-green sofa or chair.) Their prices are also generally aligned with regular, non-“eco” furniture. 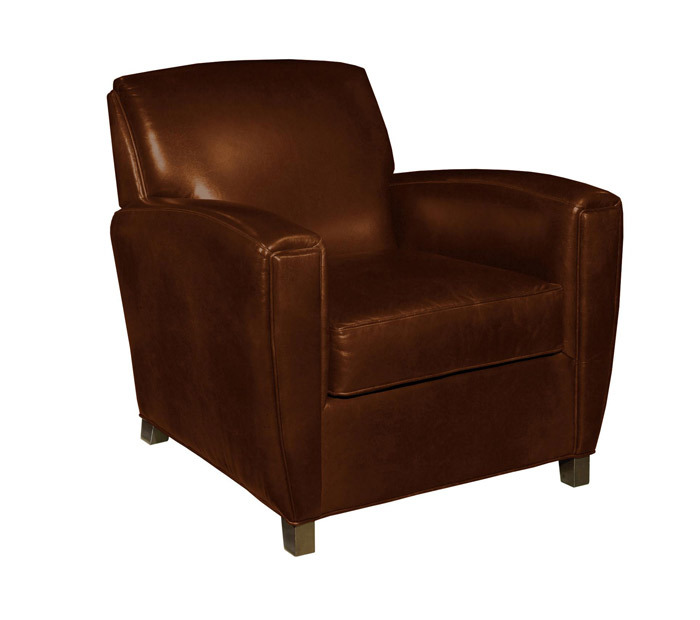 I will likely be ordering a new leather club chair to replace the icky Ikea one we have downstairs, and will look here as well for other furniture needs as they arise. On foams and fillers, he was quite helpful in explaining the options. Basically, for the foam inner core, most furniture makers use: latex, soy blend, standard U.S.-made foam or foam made overseas (often in China). For cushions, options are latex, soy foam wrapped in cotton, cotton alone, or wool interior with a cotton bag on the outside. For RCGreen designs, customers can choose the foams and fillers they like, but the materials do have disadvantages and advantages (also, he says he doesn’t use any foreign-made foams). For example, a wool-wrapped cushion or seat can feel, as you might expect, lumpy and it will likely become harder over time. Latex, he said, is reported by some customers as having an odor (though Robert doesn’t smell it), and is more rubbery or bouncy, even though in his shop it’s wrapped in cotton. Soy-based foam, also wrapped in cotton, has been free of customer complaints. All of these are available without flame retardant chemicals. The “greenest” answer on fillings is therefore likely wool, though it settles and can become hard, or natural latex (rubber). I’m a bit allergic to some types of wool, so that is not great. On latex, the notion of a sofa made of rubber (even if wrapped in cotton) doesn’t thrill me — both for comfort and because both of the furniture makers I talked to raised issues (Mr. Fonville talked about its lack of durability; Robert about a reported smell and some level of customer dissatisfaction). Even with the price break, it’s still a real investment for us to get a new sofa, and I don’t want to have to do it again. So I’m a bit stuck on this one. Robert gave me a substantial price break on the sofa before he learned I had a blog or would write about it in any way (I swear!). That’s because he indicated he’s accustomed to working with people who are dealing with serious chemical-related illnesses or extreme allergies, and he regularly offers them deals in the same way he did for me. It was stunning how difficult and time-consuming it was to find decent, chemical-free options. Here’s a summary of what I’ve learned: harmful chemical flame retardants are in most foam-based products, including mattresses and sofas. They shouldn’t be there. They don’t help to reduce fires, according to Stapleton and they may even increase the risks of a fire as people inhale dangerous chemicals when they burn. Despite this rank stupidity, they are very hard to avoid, which means that hundreds of millions of people are needlessly exposed, every day. The scale of this is actually hard to take sitting down. Just today, I also found this new post from another eco-blog with a few more companies that make chemical-free sofas — including from Eco-terric, Furnature, and Eklahome — most with hefty price points, and most latex-based. (I appreciated the input in the comments on that blog pointing out the eco-issues with soy-based polyurethane foams.) I’ve since found one more, Green Nest, with prices topping a whopping 5K for sofas. There’s always the sources for greener furniture that I identified in Part 2 of the Sofa Saga series. For the real DIY-er, here are directions to somewhat affordably make one using an “organic” mattress. For reupholstering furniture with more eco-friendly fabrics, you could check out Harmony Art and Organic Leather. If you have the dough, for really artsy “green” items (with prices to match), you can also check out a new environmentally focused artists’ market, Ecofirst Art (for lamps and similar decor, there is also has a lower-cost boutique that sells smaller items, EcovolveNow). I would be sure to inquire with all of these sources about how to ensure what you order is flame retardant-free. I would also refer you to the comments, which include an informative dialogue on fillers and foams, fabrics, greenwashing, transparency and related topics. if you know of any other sources for custom-made goods or truly green furniture, please do share them in the comments! When you do need to replace your mattress, sofa or upholstered chair, consider going FR-free! I’ve done some of the research for you, anyhoo, all you have to do is make the call.